You like me are keen to learn more about the area where I photographed Carmelite Street the other day. Just around the corner is Temple Chambers with this chap is one of the figures adorning the entrance. This part of town is where the legal fraternity hang out. Seems they have been doing so since the days of the Knights Templar's, a religious order set up in the 12th century who protected pilgrims on their way to the holy land. They did pretty well, in fact a bit too well. The crown abolished them some where around 1312 for heresy which is religious speak of the day meaning too wealthy and powerful. Nice shot! It makes me wonder what he's looking at! 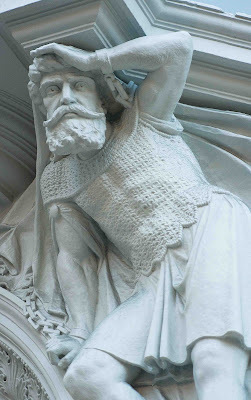 I've passed Temple Chambers many times and I have even been to the Temple Church but I have never noticed this guy! Thanks for "discovering" him! Ciao. A. The Knights Templar was on television here recently and an interesting program to watch. I would rather be doing most anything except sitting in the house looking at the sun shine on all this snow. Eating cookies sounds good to me. I don't know about you, but my head reels with ideas and things I either want to do, should do, or wish I did — that I don't have much time left to do anything but take a nap. That is some fantastic detail for a building! Look and thou shall find beautiful details like this. Give us some more please. Did you know they invented modern banking too. He really is looking straight out of the screen.